Drawstring waist with rope tie. 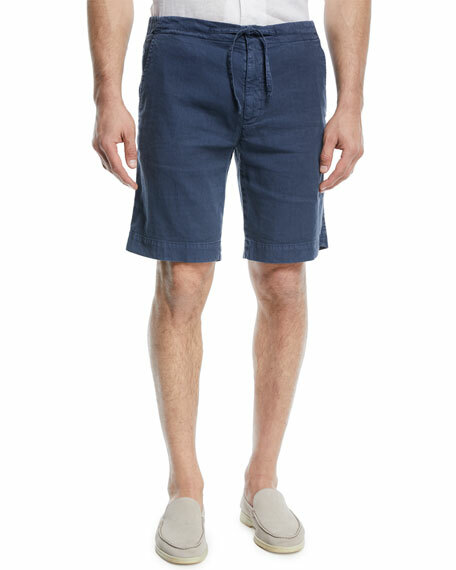 Alice + Olivia "Donald" shorts. Approx. measurements: 12" rise; 3" inseam; 16.2" back rise. High rise; flat front. Side pockets; back welt pockets. Relaxed fit. Back zip closure. Polyester/viscose/polyurethane. Polyester lining. Imported. 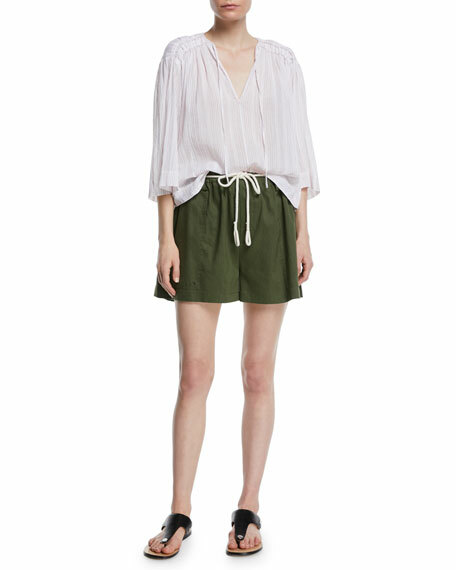 Elie Tahari "Genna" tailored shorts with trouser styling. High-rise; pleated front. Self tie belt with silvertone rings. Back welt pockets. Relaxed legs. Front zip; belt loops. Linen/polyester. Dry clean. Imported. Eskandar Italian lightweight linen T-shirt. Crew neckline with button detailing. Short sleeves. Slim A-line fit. High-low hem. 100% linen. Machine wash. Made in Poland of Italian materials.